To see Clifford Bob's talk, click here. Title: "Rights As Weapons: Instruments of Conflict, Tools of Power"
Abstract: Rights are usually viewed as defensive concepts, protecting the vulnerable and uplifting the downtrodden. But political combatants also use rights belligerently, to batter despised communities, demolish existing institutions, and smash opposing ideas. 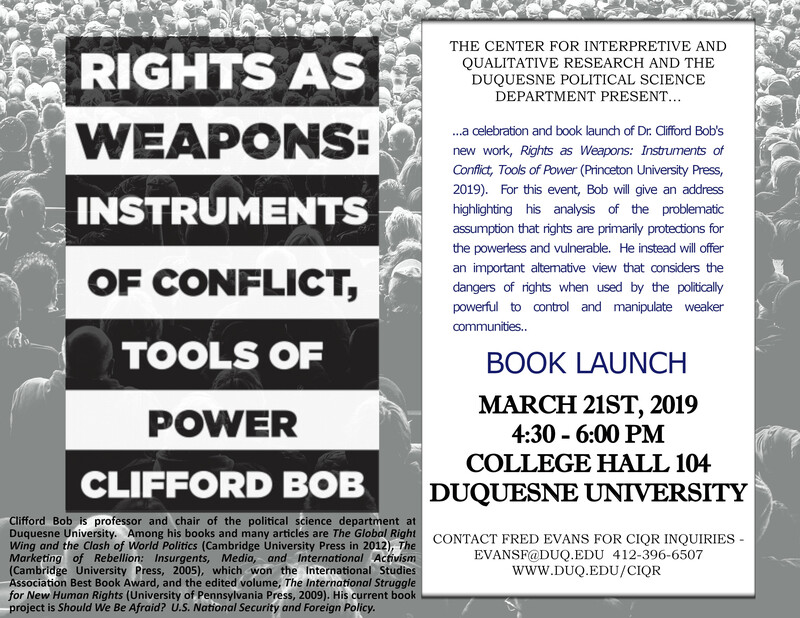 Rights as Weapons focuses on these under-examined ways in which the powerful deploy rights as aggressive tools against the weak. First, political forces raise rights as rallying cries, "naturalizing" novel claims as rights inherent in humanity, "absolutizing" them as trumps over rival interests or community concerns, "universalizing" them as transcultural and transhistorical, and "depoliticizing" them as concepts beyond debate and above politics. Second, powerful proponents employ rights as camouflage to cover ulterior motives, crowbars to break rival coalitions, spears to puncture discrete policies, and dynamite to explode whole societies. Third, the targets of rights campaigns repulse the assault, denying the abuses they are accused of, constructing rival rights to protect their privileges, and portraying themselves as victims rather than violators. Rights as Weapons applies this novel conceptual framework to historical and contemporary cases including nineteenth-century voting rights movements; the American civil rights movement; nationalist, populist, and religious movements in today's Europe; and internationalized conflicts over Palestinian self-determination, animal rights, LGBT rights, and transgender rights. Bio: Clifford Bob is professor and chair of the political science department at Duquesne University. His areas of research and teaching include human rights, globalization, and U.S. foreign policy. His book, The Global Right Wing and the Clash of World Politics, was published by Cambridge University Press in 2012. His 2005 book, The Marketing of Rebellion: Insurgents, Media, and International Activism (Cambridge), won the International Studies Association Best Book Award and other prizes. He edited The International Struggle for New Human Rights (University of Pennsylvania Press, 2009) and is the author of numerous articles and book chapters. His current book project is Should We Be Afraid? U.S. National Security and Foreign Policy. Dr. Bob holds a Ph.D. from MIT and a J.D. from NYU.